The 38th ARCO Madrid2019 International Contemporary Art Fair took place from February 27th to March 3rd 2019, which counted with the participation of Peru as Guest of Honor. BGL Audiovisual carried out the supply and installation of the audiovisual equipment and the integration of the video projection system for CULTURAL MEDIA DESIGN, who is the main contractor of the stand, under the design and museographic development of Israel Sousa. The institutional stand of Peru, conceived by the curatorial team of the Ministry of Culture of Peru’s Government and directed by Jorge Villacorta, presented a configuration inspired in the huts called “maloca” of the Shipibo-Konibo ethnic group, inhabitants of the Peruvian Amazon. The gabled roof, supported by two vertical structures, gives shelter to a communal room with two perimeter benches where ceremonies and social events take place. 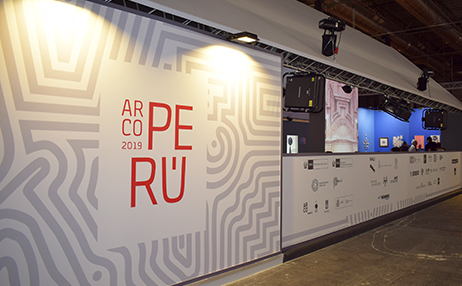 This space, interpreted for the ARCO Fair stand, served for an immersive video installation with an audiovisual production that summed up 5000 years of Peruvian artistic visuality. The Stand was a meeting and rest point for the more than 100,000 visitors assisting the Fair and achieved great success and recognition for our customers.